NEWARK, NJ - (The Comedy News) - NCAA officials have confirmed that Michael Jordan and Dwayne Wade will be playing in the Sweet Sixteen basketball tournament match-up between Marquette University and the University of North Carolina this Friday in Newark. 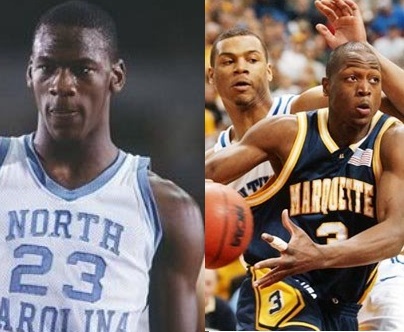 "We at the NCAA were approached by both Michael [Jordan] and Dwayne [Wade] about coming back to the Marquette University Golden Eagles and and University of North Carolina Tar Heels. We all agreed that having two legends coming back to college ball for just one game will be great for the sport, and even greater for advertising revenues," announced an NCAA official. This game will be Michael Jordan's first try at college basketball in 27 years. "All I gotta say is, I'M BACK!" Announced an excited Jordan from his home in Charlotte. "I'll be back in Chapel Hill to party it up each night this week. I've only got 3 days to get back into my college training routine! I'm pumped to bring that #23 Tar Heels jersey outta retirement." Dwayne Wade's return to the Golden Eagles' starting line-up wasn't an easy decision for the 7-time NBA All-Star. "This is gonna be a blast. Me and MJ, back playing for our schools," rejoiced Wade at a press conference. "Although, now that I think about it, I should probably tell [Miami Heat] Coach Spoelstra and Pat Reilly. I'm supposed to be in Miami at that time to play the Sixers. Eh, whatevs."